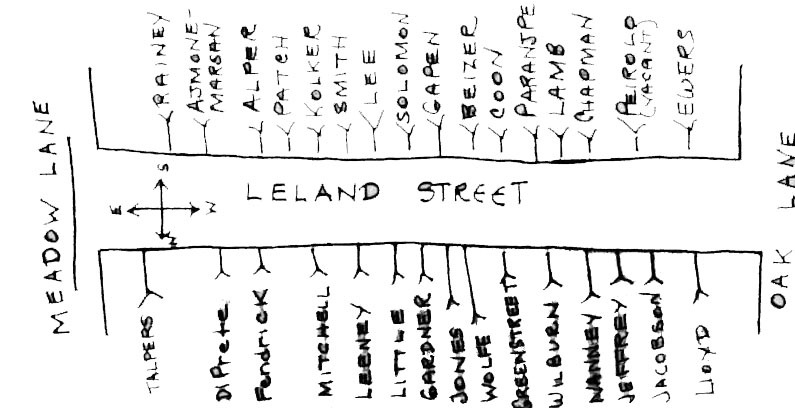 Map of Leland Street, The Leland Street Sunday News, February 10, 1974. CCHS 2010.1015.01. Community goes beyond the geographic boundaries of a neighborhood. The fabric of community is made up of the relationships, shared experiences and diversity of its residents. Brought together, these threads are not only what create community, they sustain it as well, allowing positive social interaction and open thought to flourish. Although the newspapers were produced by children, they were made possible by the existence of vibrant community life in Chevy Chase. The newspapers spread knowledge of community events, clubs and businesses; provided opportunities for community participation and utilization of the newspapers as a social tool; and fostered a sense of broader community which transcended both time and place. Catherine (Dixie) Fowler, 10 years old, The Thornapple Street News, October 8, 1931. CCHS 1989.27.01. 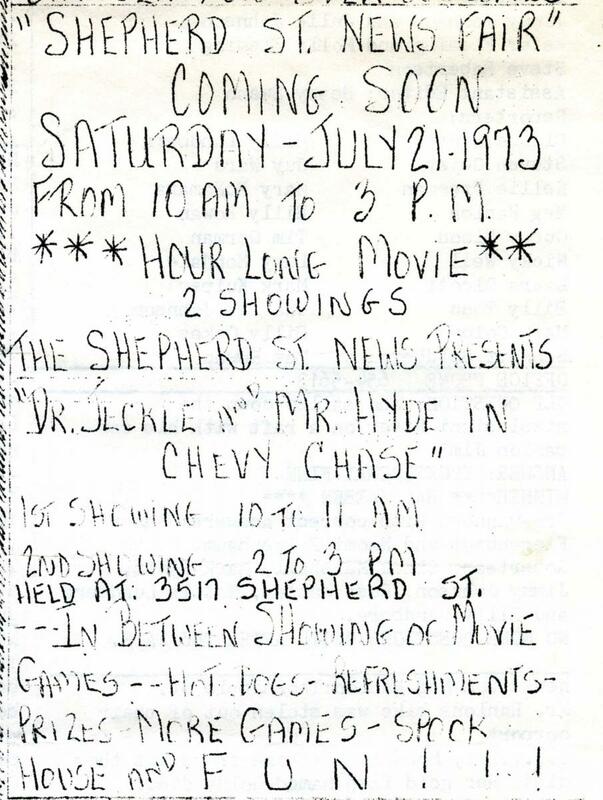 Announcement of The Shepherd Street News Fair, July 7, 1973. CCHS 1989.27.01. Documenting a social history of Chevy Chase is made easier by primary sources which record the day to day social gatherings as well as the larger events occurring in Chevy Chase in both the 1930s and 1970s. Whether Mrs. Fitts was hosting the ladies for bridge in 1931 or a group from Shepherd Street was trying to start a bluegrass music band in 1972, these activities reflect the diversity of interests on each street, and how the neighborhood paved the way for new ideas and trends. Thornapple Street in the 1930s played host to a number of gatherings, enough that editor Dixie Fowler took on the official role of "society editor" in 1936. Some of the events are evidence of long standing organizations, such as the Women's Club of Chevy Chase, while others such as the Flower Club reflect neighborhood women interested in expanding their horizons, if still in largely socially acceptable ways for women at that time. The Thornapple Street News, January 14, 1933. CCHS 1989.27.01. The Thornapple Street News. November 14, 1931. CCHS 1989.27.01. 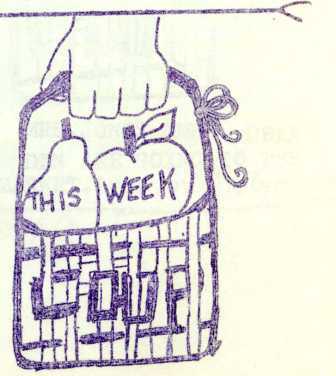 Contributions to the community calendar in The Shepherd Street News and The Leland Street Sunday News in the 1970s reflect the diversity of residents in terms of culture and profession. While still traditional in many ways, Chevy Chase in the 1970s was a product of its time, reflecting larger cultural trends of environmentalism and embracing new social perspectives. The Leland Street Sunday News, December 23, 1973. CCHS 2010.1015.01. "Several Leland streeters have discussed the possibility of co-op food buying for 4100 block households…Think about it. We'll set up a meeting the week of April 15 to discuss pros, cons, and possibilities." The Leland Street Sunday News, April 7, 1974. CCHS 2010.1015.01. The Leland street neighborhood started a food co-op in 1974. It went on to be very successful, Members gathered around the Patch’s front porch weekly to collect their share of produce. The Leland Street co-op had its own section in The Leland Street Sunday News, detailing who was collecting money and who was responsible for picking up that week’s produce. The Leland Street Sunday News, September 19, 1976. CCHS 2010.1015.03. 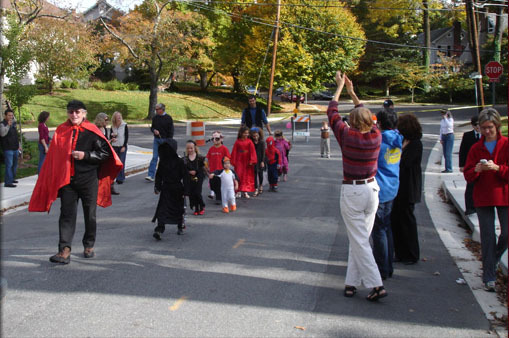 As time has passed, some neighborhood events have become annual traditions such as the Shepherd Street Block Party, the Leland Street Fall Festival, and the back-to-school Banana Split Party at the Patch’s. The latter two events continue on Leland Street today. 1976 Announcement of the annual banana split party. The Leland Street Sunday News, 1976. CCHS 2010.1015.03. The Leland Street Fall Festival, 2009. Courtesy of the Leland Street Blog.